Sometimes fractions can be easier to work with if they're in their decimal form. This tutorial shows you how to turn a fraction into a decimal with a few simple steps! Understanding place value is a building block of understanding numbers. Follow along with this tutorial to see how to find the value of a digit for a given number! 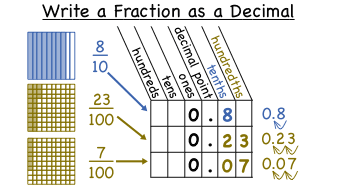 You can turn a decimal into a fraction with a few simple steps! Follow along with this tutorial to learn how to write a decimal as a fraction!